Cot Cottage in Ringford, near Castle Douglas, Dumfries and Galloway sleeps 10 people. 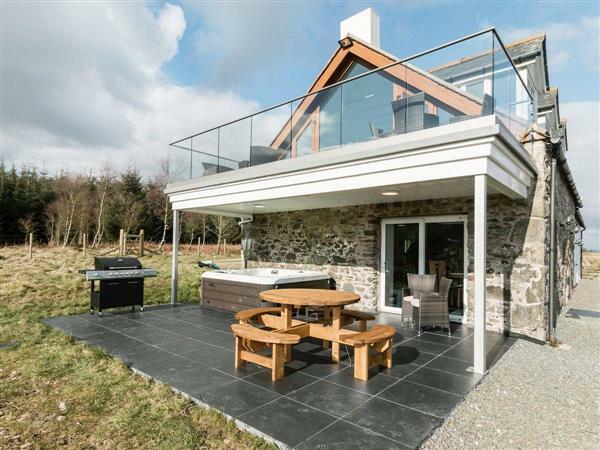 Cot Cottage near Castle Douglas is situated in a peaceful, elevated location, with stunning views over open countryside; this detached cottage has spacious grounds and also a relaxing hot tub. This fabulous area has many opportunities for hill walking, mountain biking and water sports, or perhaps visiting renowned gardens and ancient woodland with a chance to glimpse the abundant wildlife. The area is well recognised for its clear skies, as one of the 12 best stargazing sites in the world and the first Dark Sky Park in the UK. The towns of Castle Douglas, known as the food town, Gatehouse of Fleet and Kirkcudbright are all within a short drive. Gatehouse of Fleet offers a wider range of places to eat and drink, and there are many attractions in and around the town including the ‘Mill on the Fleet’ Visitor Centre, Cardoness Castle and the popular Laggan Outdoor Activity Centre, which is host to one of Europe’s longest zip wires. Kirkcudbright, known as the artist’s town, attracts visitors throughout the year drawn by the harbour, historic high street and the diverse range of annual events and visitor attractions. The popular programme of summer festivities culminates with the spectacular Tattoo, an event not to be missed. The beach is 11 miles from Cot Cottage near Castle Douglas. With the shop 8 miles, the pub is 5 miles and the restaurant is 2½ miles from Cot Cottage. Living area: With 65’’ Freeview TV and CD player. Kitchen area: With gas range, microwave, fridge/freezer and dishwasher. Bedroom 2: With king-size bed, Freeview TV and en-suite with shower cubicle and toilet (also accessed from hallway). Bedroom 3: With king-size bed and Freeview TV. Sitting room: With door leading to patio. Bedroom 4: With super king-size bed, Freeview TV and en-suite with shower cubicle and toilet. Bedroom 5: With twin beds and Freeview TV. LPG and air source central heating (underfloor in most ground floor rooms and first floor bathroom), air-conditioning (in bedroom 4), gas, electricity, bed linen, towels and Wi-Fi included. Travel cot and highchair. Welcome pack. Large enclosed garden with patio, garden furniture and gas barbecue. 11-acre natural un-spoilt grounds. Hot tub for 6 (private). 2 dogs welcome, to be kept on a lead at all times (sheep country). Bike store. Private parking for 8 cars. No smoking. Please note: The property has a natural water supply from a well and there is an unfenced loch, 350 yards away. Holidays at Cot Cottage run from Friday to Friday. Pets allowed at Cot Cottage. For a better idea of where Cot Cottage is, you can see Cot Cottage on the map below. You can find more large holiday cottages (that's cottages which sleep 8 or more people) in Kirkcudbrightshire. If you want to see more large cottages, have a look at large cottages in Kirkcudbrightshire. Cot Cottage is in Kirkcudbrightshire; should you be on the lookout for a special offer, you can find all the special offers in Kirkcudbrightshire. It's always worth checking to see what is on offer at the moment. Do you want to holiday near Cot Cottage (UKC2970), you can see other cottages within 25 miles of Cot Cottage; have a look to find your perfect holiday location.